he Barbara Ann Scott doll was made by the Reliable Toy Company in 1948 to honour the beautiful young skater who won the gold medal at the Olympics in Saint Moritz, Switzerland, that year. Barbara Ann had also won the Canadian championship from 1944 to 1948, the North American championship from 1945 to 1948, and the European and World championships in 1947 and 1948. She was awarded the Lou Marsh Memorial Trophy for the year's outstanding athlete in 1945, 1947 and 1948! In 1991, Barbara Ann was made an Officer of the Order of Canada, and in 1997 she was inducted into the International Women's Sports Hall of Fame. Barbara Ann Scott King remains a star today. 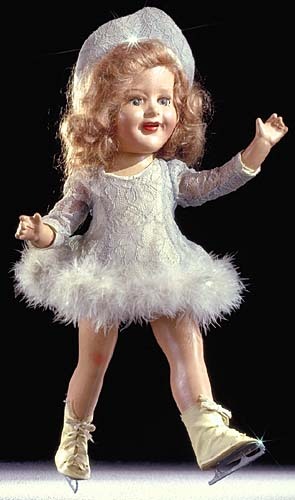 The composition Barbara Ann Scott doll was designed by Bernard Lipfert, a well-known American doll designer. In 1948, it wore a lace skating costume trimmed with marabou. A new costume was created each year and was always trimmed with marabou. The doll, which sold well until 1954, came with a hangtag shaped like an ice skate, a letter from Barbara Ann, a pair of shoes and white skates. A small book about the skater was also available. Today, most doll collectors have at least one Barbara Ann Scott doll. It is familiar to Canadians from coast to coast and has become a Canadian cultural icon.